The DEutsch STRIKE connector series features a lever lock system and is designed for heavy duty equipment applications. 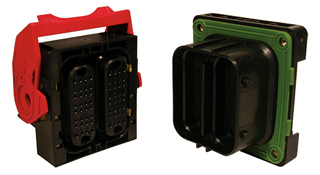 The environmentally sealed series offers three different size rugged housings that accept contacts from size 20 to Ø12mm with arrangements from 1 to 64 cavities. The lever lock combined with varying cavity arrangements allows the STRIKE Series to offer flexible options for electrical designs.